I know Ry wants Dane to win, but Kelly is just so dreamy :) AND AMAZING AT SURFING!! 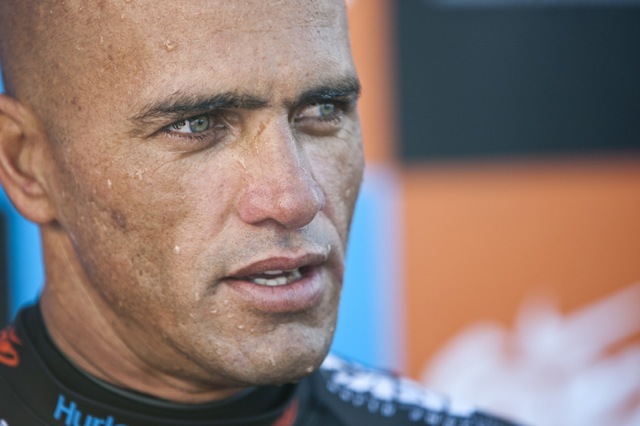 Kelly Slater is pro surfing's reigning world champion with seemingly nothing left to prove. After all, since clinching his tenth world title last year even renowned sports pundits have actually debated whether Slater might be the best athlete of all time. Way back in 1992 he ushered in a new era of high performance surfing to win his first world title at the age of 20. Today, 39-year-old Slater has owned his sport for two decades. His reign is all the more impressive considering there's been no shortage of young (read: half his age) surfing acrobats vying to knock him off. Today's young army of talent is by far the most threatening, and conditions at the Nike US Open of Surfing, held in Huntington Beach, Calif., usually favor that nimble set...But don't tell Slater that. In perfect surf that arrived on California shores Friday by way of a tropical hurricane off Mexico, surf fans were treated to some of the best performances ever seen at The Open. The acrobats, led by California's Dane Reynolds, 17-year-old Kolohe Andino, Aussie powerhouse Taj Burrow and Hawaiian Dusty Payne, repeatedly got the crowd on its feet. But nobody delighted more than Slater, who did his part by scoring the two of the best waves of the day, and one of the biggest aerials of his career. "I've been competing here since I was 12-years-old and I've never seen it this good," says Slater. "I got two sweet barrels -- at Huntington! -- and probably the biggest air of my life." Slater finished with two 9's, and moved directly to the quarterfinals. If conditions hold Slater could even nab his first US Open win since 1996.